TIME: 12:42:46. There was no preening observed in these two minutes. Kumlien's preening on the right. Beside cleaning and combating parasites, preening keeps feathers properly aligned. So how does this "interlocking" work? 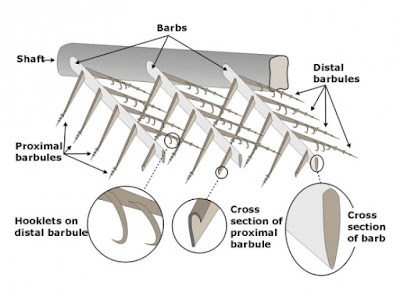 From Sibley's guide to Bird Life and Behavior: "A series of parallel barbs, which together form a flat vane (or web) on each side of the shaft, branch away from the shaft. From each of these barbs many tiny barbules branch off, with a system of hooks and ridges that holds the barbs together" (Sibley 2001). You can try locking these barbules together on recently dropped feathers. As an experiment, I recently collected several "fresh" primary feathers from Herring and Ring-billed Gulls. I pulled apart several parts of the feathers and easily "re-zipped" them by gently placing a finger under and above the feather and combing outwards with a soft pinch. It worked perfectly. I then stored these feathers in my garage for 3 months under dry conditions and tried again just a few days ago. After 3 months the barbs would not lock together seamlessly. I have to wonder if the keratin on these feathers has dried out to the point where the barbs can no longer "stick" together. Further, how much does this have to do with preen oil and its role in moisturizing and "gluing" barbules together? Waukegan, Illinois. 25 December 2015. Glaucous Gull hath done a good job evading me all season - until today! 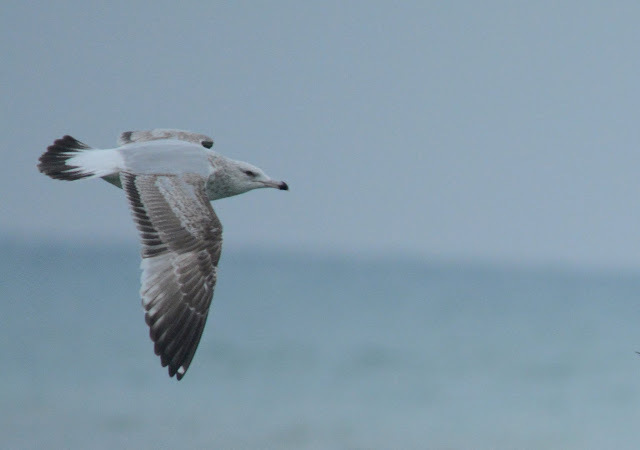 This 1st cycle was my first interesting gull of the day before being bombarded with Thayer's, Kumlien's and Lesser Black-backeds. 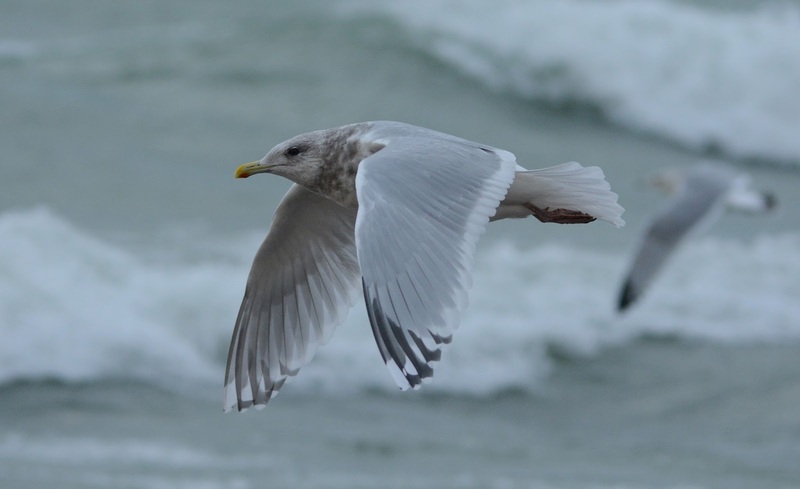 Glaucous with sub-adult Lessers in background. Extensive pigment but the shade was too pale for my idea of Thayer's. 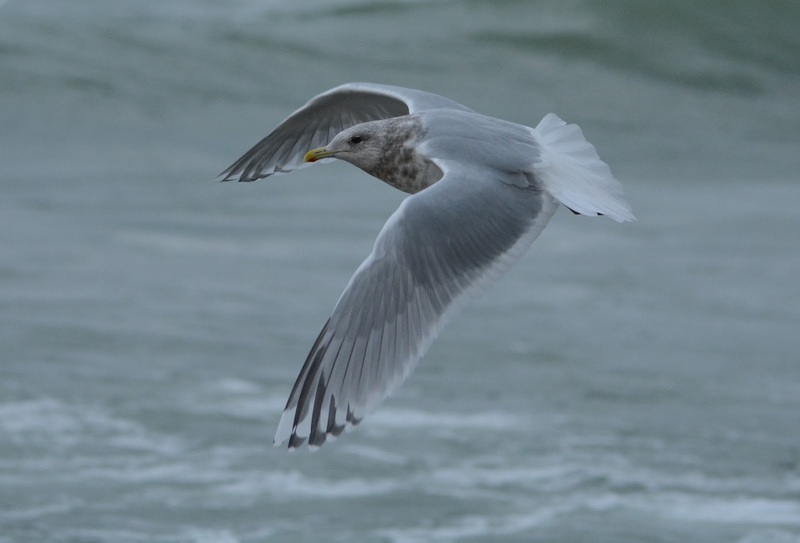 1st cycle Lesser with renewed scaps, pale head and neck. apparent shade of this bird. A nice day afield with no snow or ice still. Temps were between 34-44F. Bright sun and very little wind. 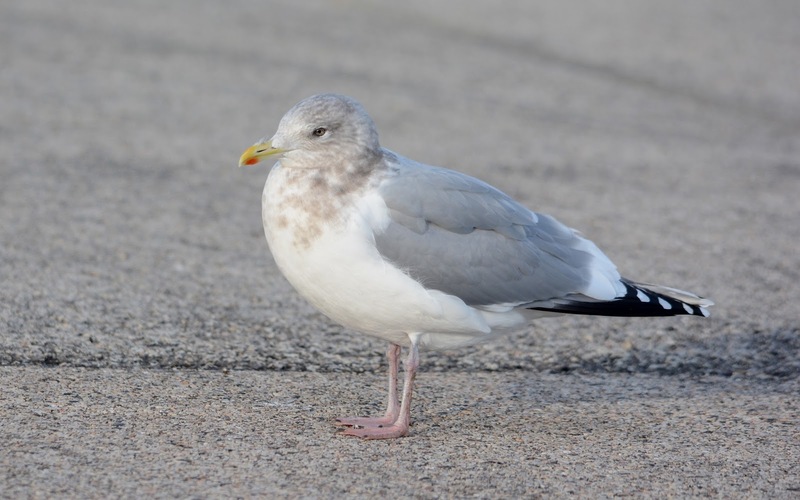 In this post I highlight an aging nomenclature question regarding some 2nd & 3rd cycle type Herrings with similar plumage aspects. The reader will note that there is much overlap in certain individuals of these intermediate ages. In particular, I'm referring to American Gulls that show a thick, solid black tailband, all-white uppertail coverts and a complete gray saddle. 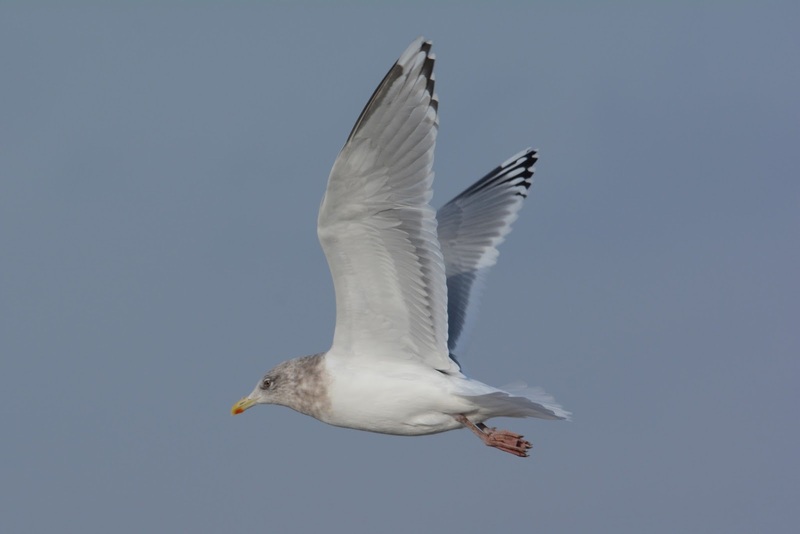 The flight feathers appear to be 2nd generation, with dark secondaries lacking adult-like white tips and mostly black outer primaries. (1) 2nd or 3rd cycle American Herring. Lake County, Illinois. 26 November 2015. My hunch tells me it's a 2nd cycle, and this is how I've traditionally aged Herrings with this plumage aspect, but read on. I will make the case that we can't be sure whether this individual is in 2nd or 3rd basic. (2) Herring Gull. New Buffalo, Michigan. 22 December 2015. Overall, the uppperwing looks more like what we'd categorize as a 2nd cycle, but this is a tricky age group indeed. Most revealing are the two inner primaries that are largely gray on both vanes with relatively thick white tips. These adult-like inner primaries are believed to be beyond 2nd generation. 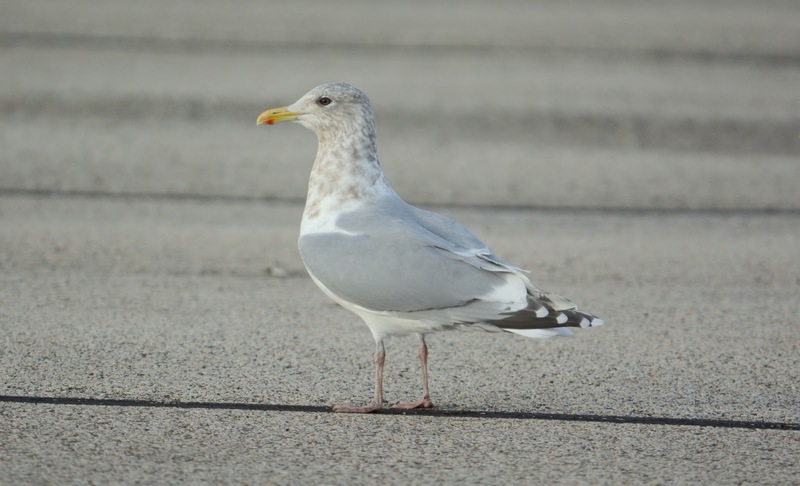 Further, the white mirror on P10 is reassuring - it's generally accepted that a mirror like this on 2nd generation primaries is extremely rare in Herring Gulls. Therefore, I comfortably assume the New Buffalo bird is a 3rd cycle. I'll be honest though, there hasn't been a time where I've seen inner primaries like #2 and haven't wondered if these "adult-like" inner primaries can be advanced 2nd basic primaries. However, I've yet to find this on any of the known-age 2nd cycles that I've recorded. 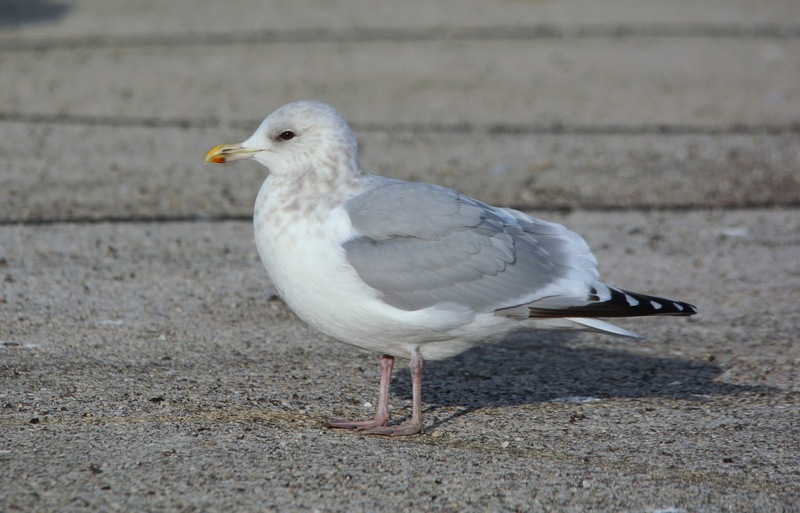 (3) 3rd cycle type Herring Gull. Chicago, Illinois. 22 November 2015. (4) 3rd cycle type Herring Gull. Whiting, Indiana. 25 January 2013. Evidently, known-age European Herrings with inner primaries such as the ones above have proven to be beyond 2nd generation. (4) 2nd cycle type Herring. Chicago, IL. 26 October 2012. 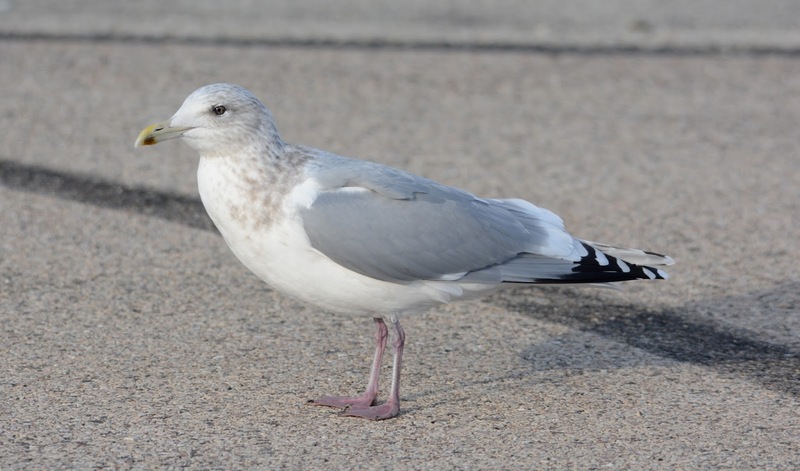 The similarities are great: all-gray saddle, pink bill with black tip, all-white uppertail coverts with thick black tail band, incoming gray median and lesser upperwing coverts, secondaries with solid dark centers that are narrowly tipped with grayish brown. I'd like to think the most distinguishing feature is the pattern to the inner primaries. Notice how they have a brown wash to them with obvious dark subterminal tips on the outer webs. These feathers, in my opinion, are not remotely adult-like. I've never found a known-age 3rd cycle type with inner primaries this delayed. I feel confident in aging #4 as a 2nd cycle type. 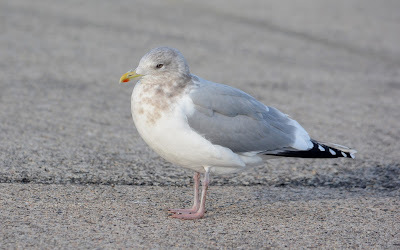 (5) 2nd or 3rd cycle type American Herring Gull. Lake County, Illinois. 25 December 2015. 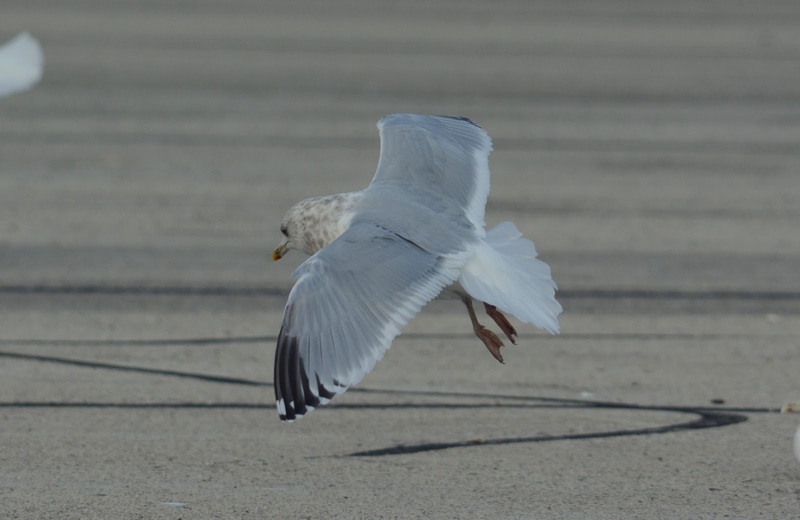 Keep in mind that a mirror on p10 - such as is seen here on both wings - is extremely rare in 2nd cycle American Herrings (or is it?). The brown wash to the innermost primaries, showing contrasting dark outer webs is not what I associate with 3rd generation primaries - the so-called "adult-like" pattern as is seen in #2,3 and 4 is absent! How exactly do we age this bird? Perhaps there's no place for the word "exact" in this context. Data from known-age birds have become more important than ever, and I feel we'll be able to shed some light on this aging question with due time. 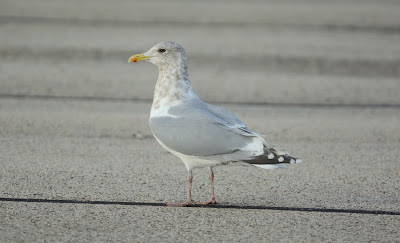 (6) 2nd cycle type Herring Gull. Daytona Beach Shores, Florida. 23 January 2015. (7) 3rd cycle type Herring Gull. New Buffalo, Michigan. 28 September 2014. #7 is borderline, with subtle inner primaries that are somewhat "iffy". 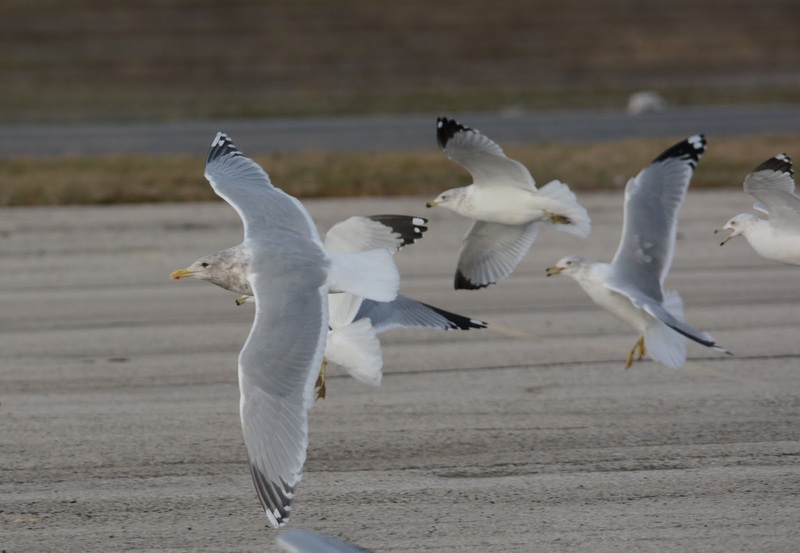 Do we view these brown-shafted feathers as delayed 3rd or advanced 2nd generation? The mantle is still showing some brown scaps and brown ribbing on the uppertail coverts. 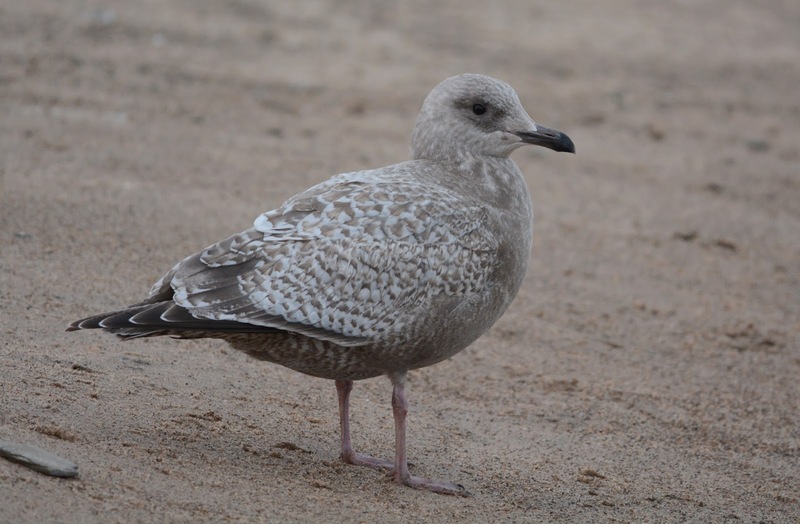 Still, the tips to P1-P3 have relatively thick, adult-like, white tips. 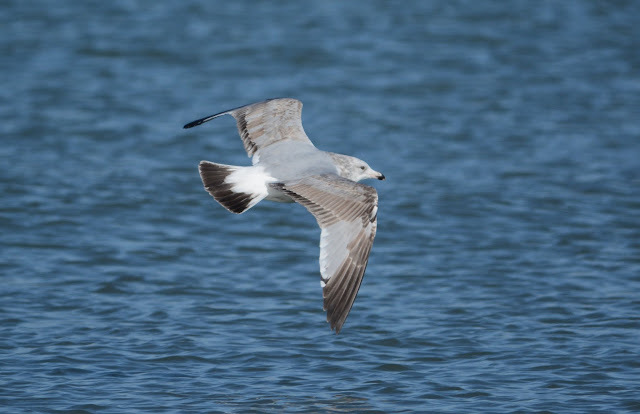 Both vanes to these primaries are showing adult-like gray, albeit with soft brown washing on the outer webs. Here are #6 and #7 in profile, both looking 2nd cycle-ish. Are the inner primaries (p1-p3) in open wing #7 sufficiently "adult-like"? Are there known-age 3rd cycle Herrings with retarded inner primaries such as #5? Are there known-age 2nd cyles with "advanced" innermost primaries as seen in #2? What, if any, are some reoccurring patterns on the secondaries of individuals that have apparent adult-like inner primaries? 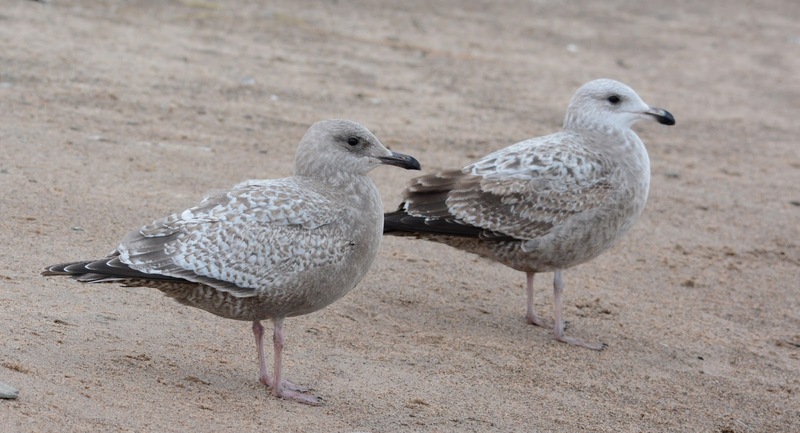 Can the pattern on the primary coverts be a clue to aging these adult-like inner primaries? Could some of these individuals be "advanced" 2nd cycles that may require 5 plumage cycles to attain definitive adult basic? New Buffalo, Michigan. 17 December 2015. A bit too pale for my Thayer's gauge. Photo 1 of 4. Center. Photo 2 of 4. Lake County, Illinois. 18 December 2015. Adult Thayer's. Photo 1 of 2. Near Adult Thayer's. Photo 1 of 2. 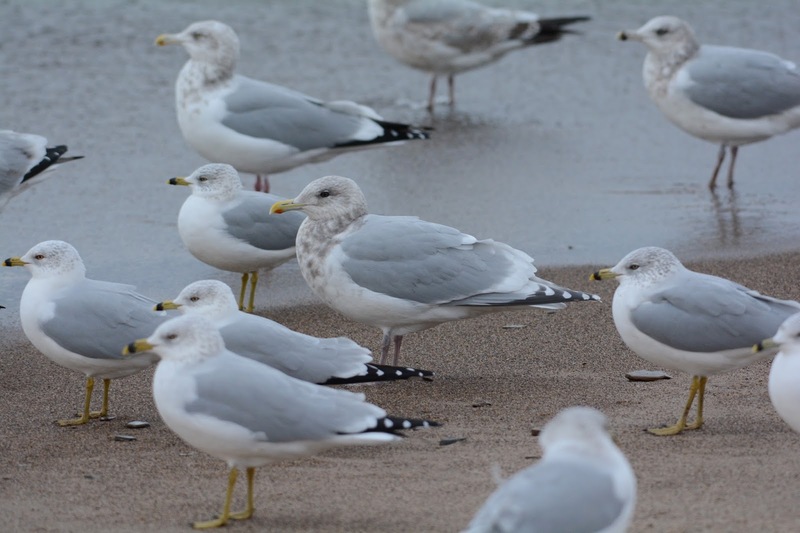 Intermediate Adult Thayer's/Kumlien's. Wingtips too pale for THGU. Left wingtip more representative of color. Photo 2 of 2.